Over the past several weeks, I have been discussing many interesting features of Mathematica. As a continuation, today, I would like to show some cool functionality in the domain of computer vision and machine learning. 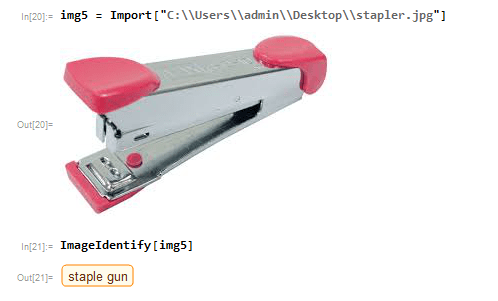 The function ImageIdentify tries to identify the object in the given image. According to the documentation, Mathematica knows about more than 10,000 objects. To test this feature, I downloaded a few images from the internet. You can see the interaction below. The first example involves a truck. 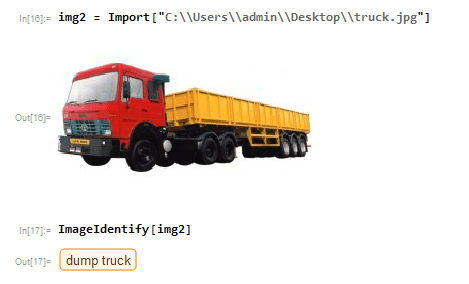 Mathematica was able to correctly identify the truck. For the second example, I downloaded the image of a fountain pen. Although we humans can correctly identify this object as a pen, I thought Mathematica might have some trouble because, the cover has been removed and kept by the side of the pen, making it seem like two different objects. But Mathematica had no problem! The third example is a stapler. Mathematica got it correct this time too. 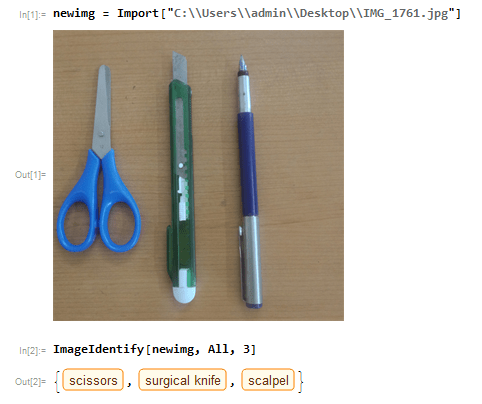 Mathematica could not identify the object in the next three examples. I thought it was odd because USB Pendrives are so common these days. 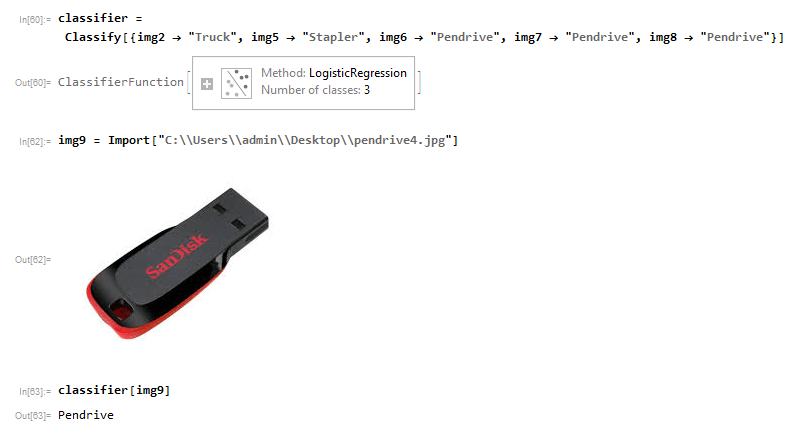 That is when I thought maybe I should teach Mathematica to correctly classify pendrives. The Classify function allows us to give classification examples to Mathematica, from which it will generate a suitable Classifier. This latter function can then be used to classify a new object based on what it has been taught. The Classify function takes an array of <example, class> pairs, and returns a classifier. You can later apply the classifier on a new example to get the appropriate classification. 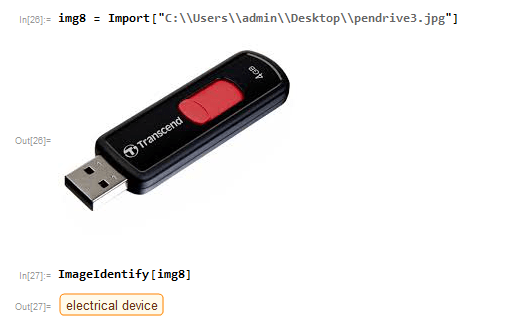 The figure below shows my examples, and how it eventually correctly classified the new pen drive (not seen before). That is good! Of course, things are not that easy in the real world. Many, many more examples have to be supplied. It appears that the fountain pen has been classfied as a sort of knife. I guess the similarity is there, but given that in our earlier example, it was able to correctly identify a fountain pen, I was a bit surprised. It could be due to the orientation of the pen, or lack of sufficient detail, I assume. 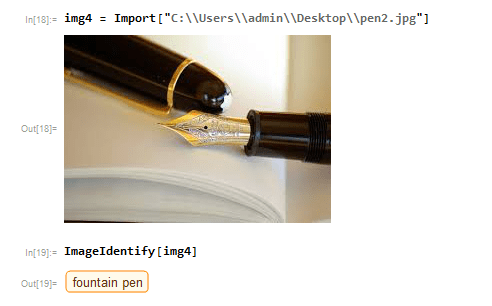 Perhaps Mathematica folks should consider doing more training on the fountain pen data set. Next, I decided to take a look at the image processing side of Mathematica. The cool thing is that Mathematica has hundreds of functions in each of the domains it supports, and so if you have the patience and the inclination, you could go as far as you want (of course, I have my own wish-list for Mathematica, but that is a different topic). 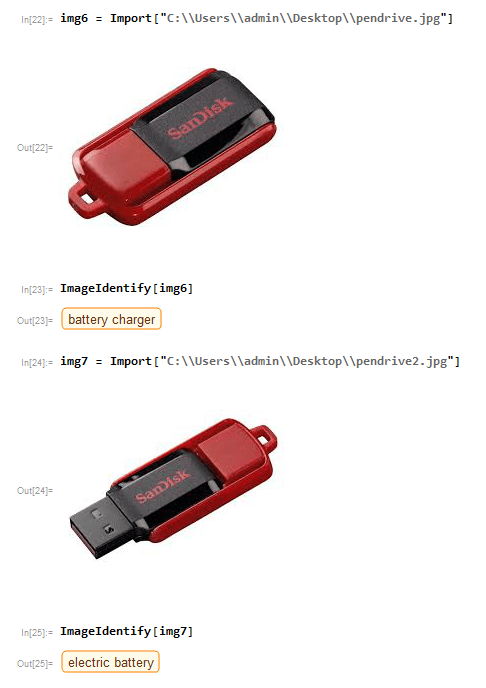 Given the last image with multiple objects, let us ask Mathematica to detect the edges. We can use the EdgeDetect function. This function finds edges in an image, returning a binary image as result. 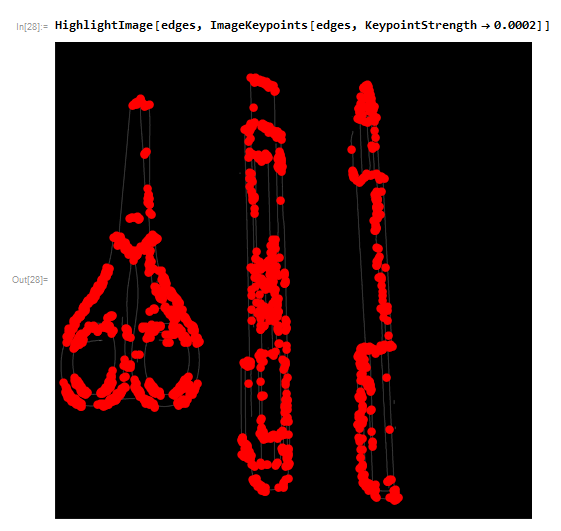 I then used the ImageKeyPoints function to detect the key features in the binary image and highlight their coordinates. Interesting. So, we could go on like this, but let me stop here for now. More interesting stuff in the next post!